Flowers are an essential part of making your wedding day beautiful. 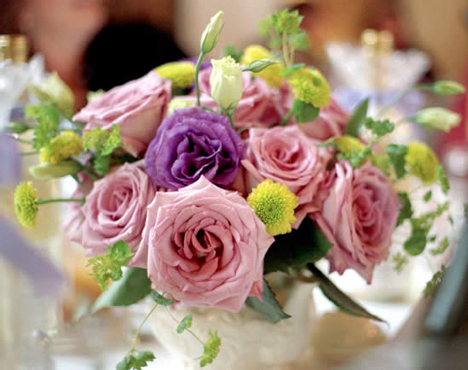 From your bridal bouquet to the reception centerpieces, the splendor of the flowers can make or break the look. It's important that you take your time in selecting a wedding florist in order to find a reliable and experienced vendor that can provide the amazing flowers you want at a reasonable price. First you need to narrow down your list of possible florists. Ask your friends and relatives for recommendations. Also ask your reception facility and other vendors for names of florists that they have worked with in the past. 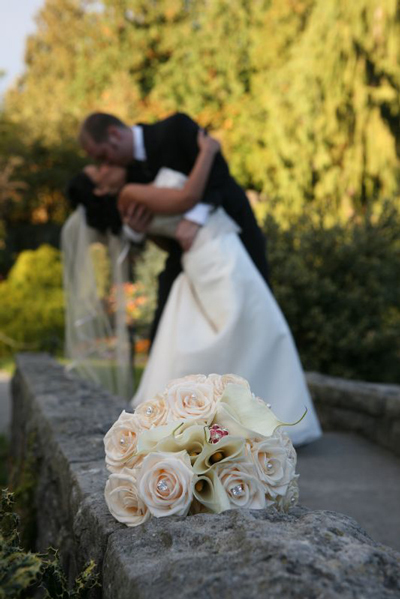 Select five or six florists in the general vicinity of your ceremony and reception site. Call each one and ask a very important question -- "Do you have my wedding date open?" If they don't, there's no reason to waste your time on anything else. If they do have your date open, set up an appointment to visit the shop. The high-tech way of doing this is WeddingRequest.com. It saves you the calls and the time. On the other hand, you may want to actually hear someone's voice and have a short conversation. Either way, find wedding florists near you, in our Directory! Before arriving at your appointment, you should have a general idea of what types of flowers you want and how many you will need. Bring tear-outs from bridal magazines or print-outs from websites showing the kinds of bouquets and arrangements you like. This will give the florist the general idea on where to begin. The florist will ask several questions, such as your wedding colors, number of bridesmaids who need bouquets, number of attendants and family members who need corsages/boutonnieres, etc. 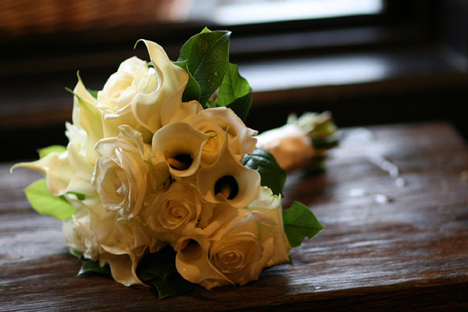 The most basic wedding package will include the bridal bouquet, bridesmaids' bouquets, corsages and boutonnieres. You may also want centerpieces for reception tables, including guest tables, the head table, banquet tables, cake table and other stations at your reception. You can also purchase flowers to decorate the cake itself. 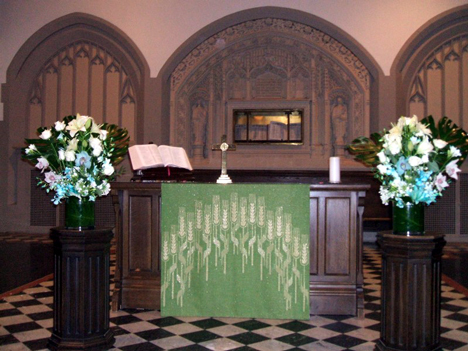 At the ceremony site, flowers can be utilized to decorate the altar, mark the aisles and in large displays around the church. Also keep in mind that you may need flowers for the flower girl, as well as a smaller bridal bouquet for the toss. When meeting with the florist for the first time, keep your wedding budget in mind. You should have a high end number for the maximum you want to pay. The florist will show you a series of photographs of previous weddings they have done. They will also explain the different packages available. From their photographs and your own preferences, you can come up with a general idea where to begin. 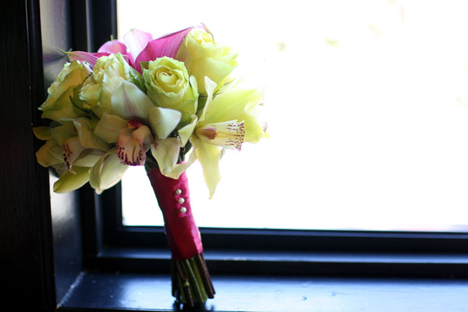 Start with your own bridal bouquet and work from there. 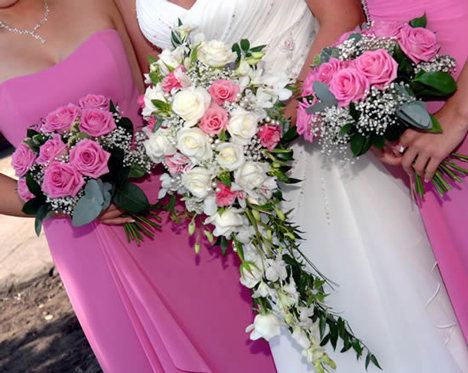 You have many different types of bridal bouquets to choose from, ranging from a basic hand-tied posy to a elaborate, floor-length, cascading bouquet. 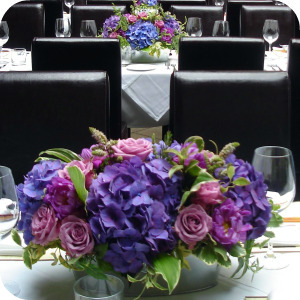 Work with the florist to develop a couple different customized packages with varying types and quantities of flowers. Ask for a written quote from each florist that you meet, including all delivery charges and extras. Right after the appointment, write down a few notes to yourself about each florist, including their personality and demeanor. After all, you don't want to deal with any primadonnas -- you are the only diva on your wedding day! Once you have visited the shops on your list and gathered quotes, narrow it down to three or four florists that you really liked in your price range. Ask each one for a list of references from their previous brides. They should be able to give you a handful of references. If they can't, it's definitely a warning sign. Call each reference and find out more about the florist. Were the flowers on time? Were they fresh? How was the quality? Were there any other issues dealing with the florist or shop? Now that you have several quotes and references are checked, you can now talk with your husband-to-be and make an informed decision about the florist. If you really aren't satisfied with any of the florists you have met with so far, don't settle. Instead, get out there are start researching some more. You shouldn't settle for a so-so wedding vendor. Before signing the contract with your florist, read it very carefully. Make sure that you understand any fees involved for cancellations, date changes or last minute additions. If you book your florist well in advance of your wedding, check back with him/her a few weeks before the wedding date. Be sure there aren't any issues with getting any of the flowers you ordered. The day before your wedding, call the florist again to confirm the time and directions to your location.